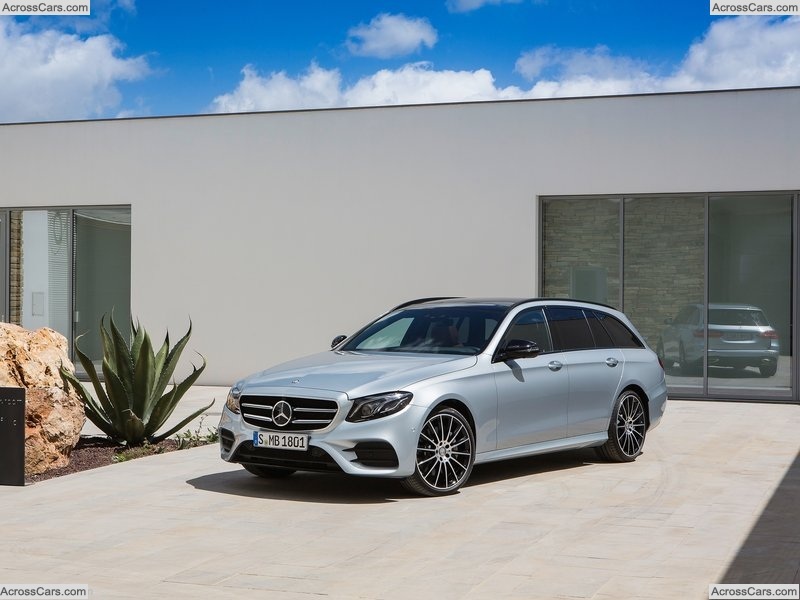 The estate version of the latest model E-class will be presented at the MercedesCup tennis tournament to be held in Stuttgart: during its debut the sixth-generation model will prove its acceleration capacity and spaciousness. Due to innovative engineering and convincing conception of space the model became the most intelligent estate among all cars manufactured by «Mercedes-Benz». Concerning the space on offer the Mercedes-Benz E-class Estate remains one of the best in its segment: its cargo volume reaches 1820 litres. Its headroom and elbowroom in the rear are on the top of all other versions in this class. In the end of 2016 the Estate will be complemented by a third, folding bench seat for children. 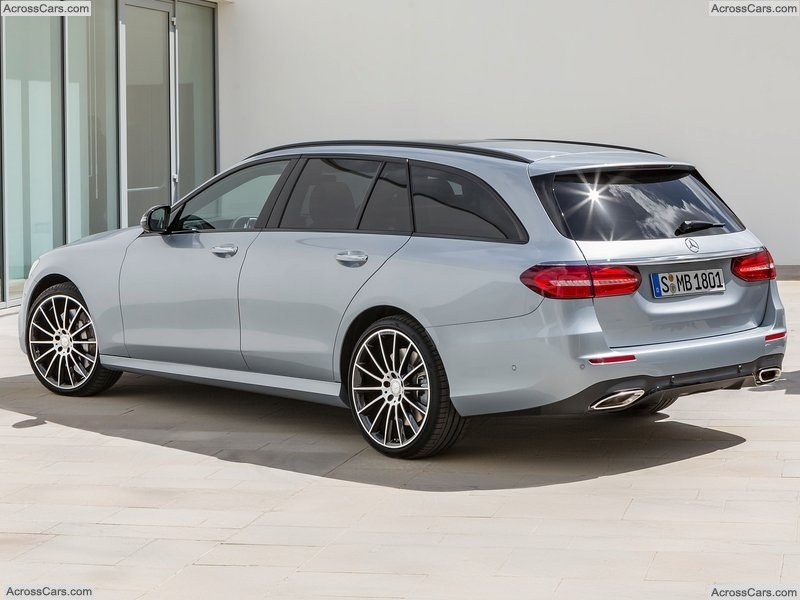 The new estate will be launched at the market in the E 200 model version equipped with a four-cylinder petrol engine (135 kW/184 hp) as well as the E 220 d (143 kW/194 hp) representing a recently completely developed four-cylinder diesel engine and torque designed with a 350 newton metres length. In the fourth quarter of 2016 the company will present E 200 d with 110 kW (150 hp) engine output along with the E 350 d featuring a six-cylinder diesel engine, and the E 400 4MATIC equipped with a six-cylinder petrol engine generating 245 kW (333hp) and 480 newton metres length torque. When entering the market all models include the new 9G-TRONIC nine-speed automatic transmission. Capacity of 670 to 1820 litres makes the load compartment of E-Class Estate one of the biggest models in the segment. The backrest of rear bench seat can be positioned at an approximately 10-degree steeper angle. Besides, the rear seat backrest provides numerous potential configurations. Electric switches placed in the load compartment and on the left and right near the backrests allow to release them. 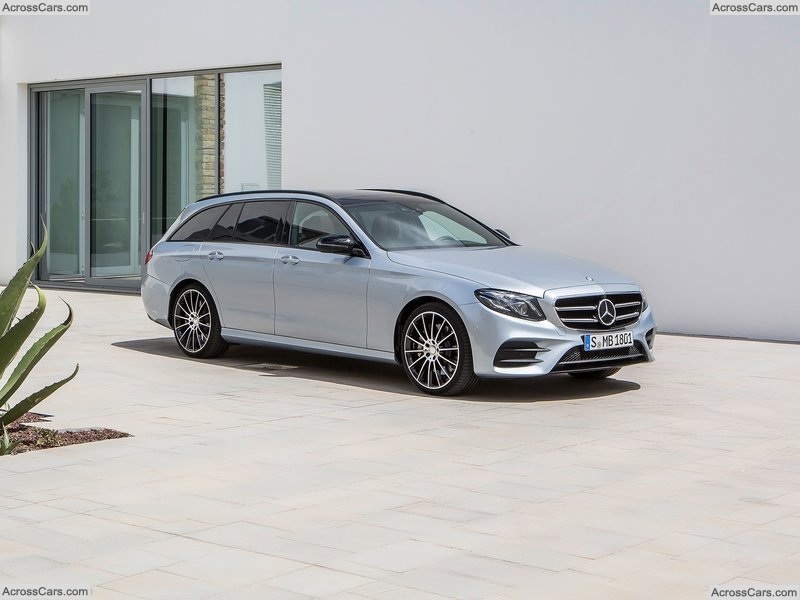 The developers focused on practical dimensions and groundbreaking management of cargo area: for example, the new E-Class Estate is one of the vehicle models capable of accommodating a Europallet. Minimum width of load compartment between the wheel arches enables to retain excellent measurement of the previous model. While opening the tailgate the load compartment cover moves up actuated by the electric drive. 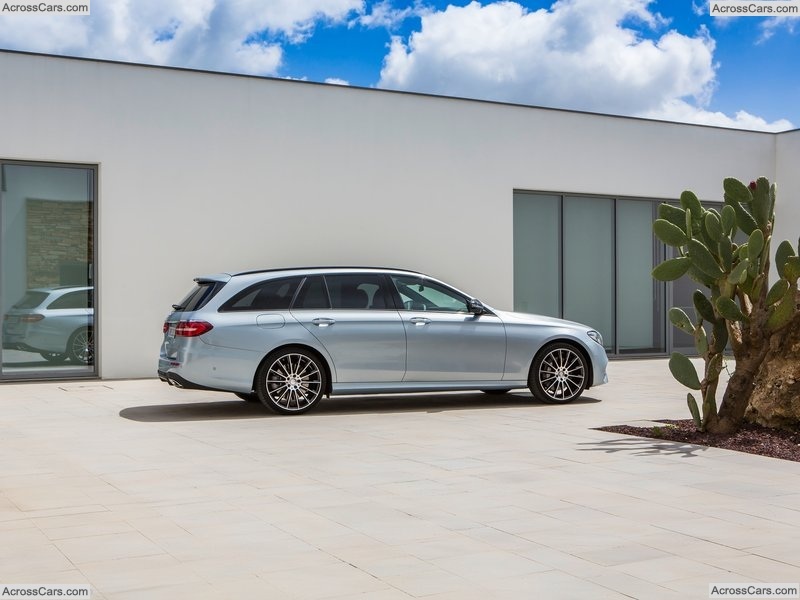 Self-adjusting rear air suspension remains integral to the concept and guarantees constant horizontal position of the Estate even if an auto is fully loaded. The new E-Class estate's appearance is featured by modernity, confident stylishness and dynamics. There are different variations of the powerful front depending on the preferred design. The basic version includes the classic Mercedes radiator grille decorated with the star as the EXCLUSIVE line that reveals an insignificant difference in design. Interior design of the Estate embodies emotions and intelligence. Two optional wide and brilliant displays with high resolution can serve as an adornment for the instrument panel. Together, they form a widescreen cockpit as they are placed under the same glass cover. The interior style is defined by means of high-quality materials including open-pore woods, smooth lines ensure yachting look. Authentic materials are also used in design of the door with leather upholstery and the beltline. Another distinctive feature is top-quality look and feeling rigorous attention to trifles and workmanship. Ergonomic form of seats suitable for long journeys in combination with sophisticated appearance represents an exclusive design for each line. Heat Comfort package presents another novelty in this segment. The Concierge Service provides various options of customized support of clients including provision of information concerning cultural and sporting events and ensuring vehicles with navigation destinations. Telephone communication with the Concierge Service is available in a predetermined language in 19 countries of Europe by means of using the iCall button. The rear bench seat in the E-Class can be transformed into communication centre and a cinema with the help of several easy actions. The extended range of top-quality and secure Mercedes-Benz restraint systems comprises the new KIDFIX XP child seat created with the assistance of child seat producer BRITAX RÖMER. The new E-Class Estate vehicle is characterized by the maximum quietness in its class. Noiselessness and reduced vibration considerably increases comfort especially during long trips. Vibrations and noise have been reduced thanks to the rigidness of vehicle construction. Insulation on the bodywork along with sound absorption prevents sound leakage into the car salon. The kinematic design of the chassis, axles and steering system decreases discomfort as a result of uneven road surface, unbalanced wheels or during braking. Aeroacoustic facilities comprise hermetic door and optimal features which are necessary for sealing areas. Inside sealing rails have been improved as there is no separation sealing rails and the window run channel thanks to positive locking system. The outside mirrors and A-pillar have also been modifying in terms of acoustic features. The areas of the roof and sliding sunroof are distinguished by a low level of noise. Numerous wind-deflection measures guarantee absence of noise as in the previous model in spite of larger size of aperture. Minimum level of ambient noise in a vehicle salon is achieved thanks to a specific acoustic film located in the windscreen and side windows. The Acoustic Comfort package provides extra insulation in the area of rear footwell and centre tunnel. Laminated safety glass was used in the construction of car salon in order to ensure prefect thermal insulation. The new E-Class is distinguished by high level of safety, comfort and decreased workload of a driver. Active Brake Assist can inform the driver about imminent collision of a car and lend assistance by providing emergency brake application. Other priority is the DRIVE PILOT that automatically maintains proper distance of a car on any road surface.